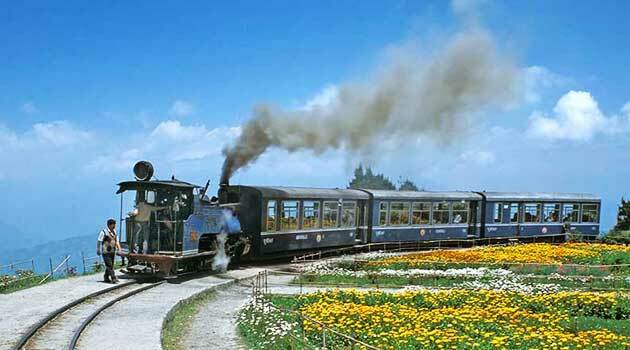 What strikes a visitor to Sikkim all at once is its colourful culture. That unique unity in diversity that also happens to be a much regarded spirit in the country is apparent in Sikkim too. With a whole lot of unique festivals, the vigour, the zest and the centuries of myth and lore behind them could indeed turn Sikkim into anybody?s wonderment. Rural fairs still abound, the mask dances at the time of a monastery?s annual ?puja? is still intriguing and ?Pang Lhabsol? (the worship of Mt Khangchendzonga) is the only religious festival in the world that has its origin and celebration in Sikkim. The state could be best visited at the time of such celebrations and one could indeed savour the taste of these legendary fests. 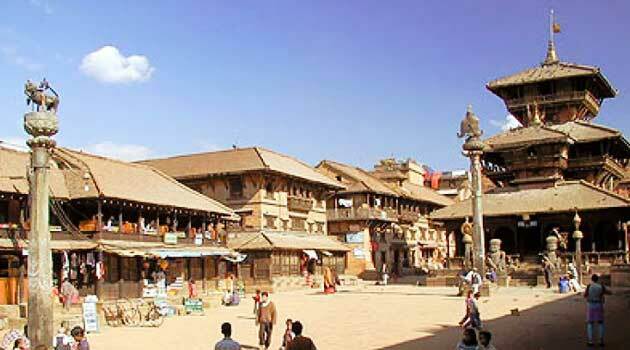 Apart from these ancient traditional celebrations various tourism festivals are also organized in different parts of the state to entertain the tourists and also acquaint them at a short notice all the aspects of the local culture from food, tribal shelters, clothes, local flowers, music, sports and myriad other subjects of interest. We have the ?Maghey Sankranti? 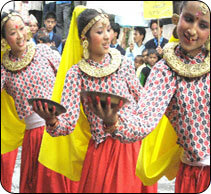 celebration at Jorethang in South Sikkim sometime in January, there is the ?Namchi Mahotsav? at Namchi, South Sikkim in October, the ?Gangtok Festival? at Gangtok in December and other such regional festivity. One of the holiest of all the Buddhist festivals it is the ?Triple Blessed Festival?. Belief has it that on this day Lord Buddha is said to have taken birth, attained enlightenment and passed away achieving Nirvana and Saga Dawa is thus a celebration of these three auspicious events. On this day one could witness long processions carrying holy books and images from a monastery. The festival falls on the 15th day, full moon of the 4th Tibetan month coinciding to end May or early June. ?Lha? means ?heaven?, ?Bab? means ?descent? and ?Dhuechen? means ?Festival?, this festival thus symbolizes the descent of Lord Buddha from the heaven of the thirty three gods after paying a visit to his mother. 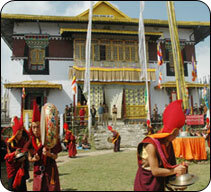 This festival is the worship of the Khangchendzonga range. It also marks the signing of the treaty of blood brotherhood between the Lepcha Chief Te-Kung-Tek and the Bhutia Chief Khye-Bum-Sa thus establishing brotherhood between the Lepchas and the Bhutias. During the celebration a masked monk dancer portrays the guardian deity as a red faced God with a skull crown astride a snow lion. The festival falls on the 15th day of the 7th Tibetan month sometime in end-August. Held on the 4th day of the 6th Tibetan month around August this festival celebrates Buddha?s first preaching of the four Noble truths to his first five disciples at Sarnath. Prayers are held at the main monasteries in Sikkim. It celebrates Sikkim?s New Year with ?chaam? dances and marks the end of the harvest season. These dances symbolize the exorcizing of the evil spirits of the old year and welcoming of the New Year. Celebrated from the 1st to the 7th day of the 11th month of the lunar calendar corresponding to December/January. Sometime in February this Tibetan New year is marked by family gatherings and a lot of celebrations. This is the principal festival of the Tashiding monastery observed on the 15th day of the 1st Tibetan month (February or March). ?Bum? meaning ?vase? and ?Chu? meaning ?water? 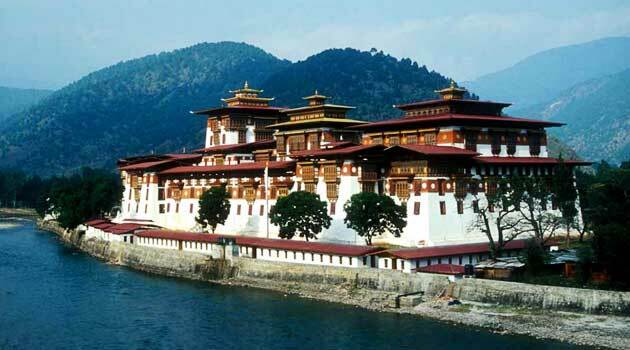 this holy festival is marked with the opening of a sacred vase highly revered in the monastery and by millions of devotees. 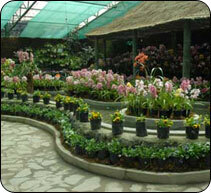 Since ancient times the water level in the vase is believed to foretell the future of Sikkim. The holy water is then distributed to the devotees who stay up all night to receive it. 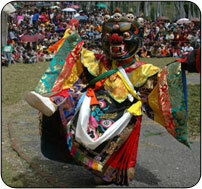 A Lepcha festival held every year at the Tendong hill in South Sikkim in the month of August. It is a worship of the Tendong hill as it is believed to have saved the Lepcha race from being destroyed by a deluge. A Hindu festival celebrated by the Nepali Hindu community falling usually in October. Also called the ?Durga puja? the festival celebrates the victory of the Goddess Durga over evil. It is celebrated for about a fortnight and is marked by family gatherings and feasts. On the tenth day is the ?Vijay Dashmi? that celebrates the victory of Lord Rama over Ravana. The family elders lay a ?Tika? (a mark of coloured rice) on the foreheads of the younger ones and shower them with blessings. Popularly know as ?Diwali? or the festival of lights this is another major Hindu festival. The Goddess Laxmi or the Goddess of wealth is much revered during the festival and is welcomed with bright oil lights to ensure prosperity. A brother?s day is also celebrated and traditional carols called ?Bhailo? and (Deusi) are sung by separate groups of girls and boys in every home. A traditional Nepali festival, rural fairs are usually held near the confluences of rivers which are considered sacred on this day. It usually falls in mid-January. This year round display of exotic flowers is held near the White Hall and one can witness the beauty of all the seasonal flowers blooming in Sikkim. These are traditional dances of monasteries performed by monks at certain time of the year. The monks put in a lot of time and effort in preparing for this annual dance also called ?Chaam? which is a public event. A large number of devotees flock in to witness the dances at the monasteries. The dances portray various deities in ferocious masks and elaborate costumes with prayers and rituals. Jesters called ?Atchers? form the other interesting feature of the dance who keep the crowd entertained with their mischievously hilarious antics, assist the dancers and also manage the crowd. The dances are usually performed to invoke the local deities to cast away evil and usher in the good spirits for a prosperous year. The Kagyat dances are held from the 28th to 29th of the 10th Tibetan month and is marked by dances at various monasteries in Sikkim. During the celebration effigies representing evil are burnt to invite an auspicious New Year. 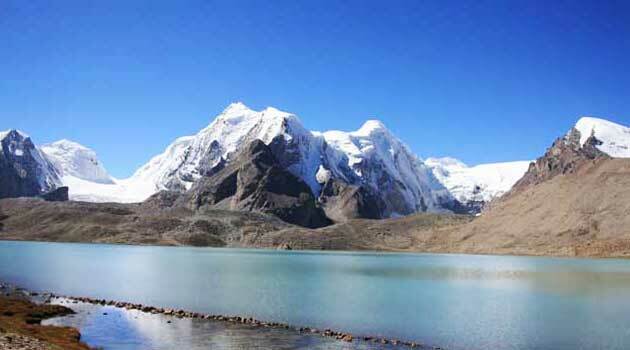 The Gutor Chaam is held two days ahead of Losar which happen to be the Tibetan New Year. Mask dances are held at the Rumtek monastery and the Pemayangste monastery in Pelling.The Tse Chu Chaam is held on the 10th day of the 5th Tibetan month with the ancient black hat dance at the Rumtek monastery.